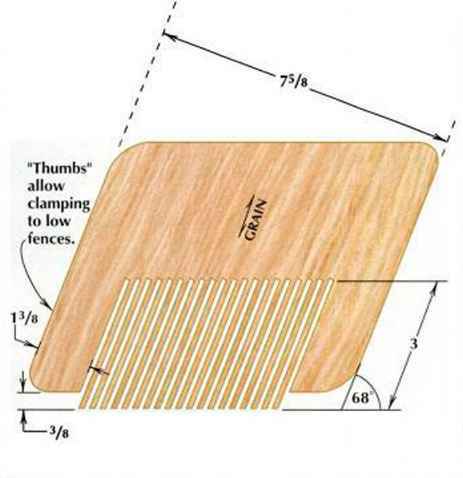 "Thumbs" allow clamping to low fences. Holding it down. The fence featherboard holds work firmly against the table. It is useful for sawing dadoes and rabbets of consistent depth or tor general ripping. can also be used in tandem, as shown in the lead photo. To set up a featherboard. begin by adjusting the machine's fence to its desired position. Then, with the cutter lowered below the table, place a piece of the stock against the fence. 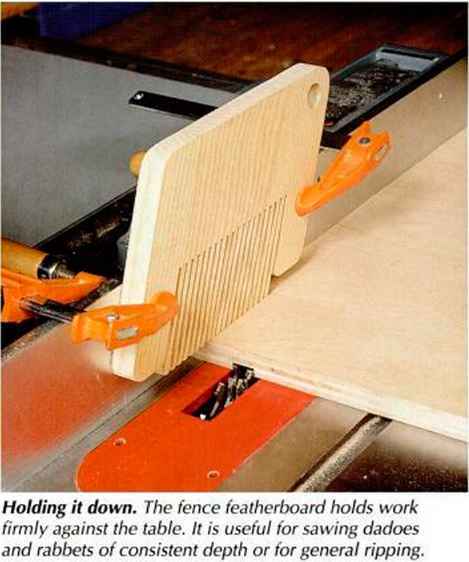 Press the featherboard fingers against the stock just hard enough to begin to bend the fingers, and clamp the featherboard to the table or fence with two opposing clamps, as shown in the various photos. Next, with the cutter still lowered, try feeding stock through the setup. Each finger should bend slightly as the stock contacts it and the workpiece should be difficult to pull backward.